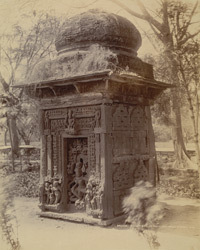 Photograph of a collection of sculptures in the Artillery Mess Gardens at Sagar in Madhya Pradesh from the Archaeological Survey of India Collections, taken by Henry Cousens in c. 1894. Cousens was travelling through Western India for the Archaeological Survey when he visited the ruined fort at Sagar. Whilst there he took photographs of four kiosks in the Artillery Mess Gardens which had been assembled from a collection of old temple sculptures gathered together by a former tenant of the Mess.